Captain James Cook gave the Bay of Islands its English name when he visited in 1769. He anchored off Motuarohia just around the Kororareka headland and declared the Bay of Islands “a noble anchorage”. 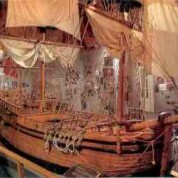 Russell Museum’s ship wing highlights the strong maritime theme that runs through the town. The large model of Cook’s Endeavour is central but tribute is also paid to the French presence. Marion du Fresne anchored nearby in 1772, and Dumont d’Urville made three visits between 1824 and 1840. Russell Museum has a model of Dumont d’Urville’s ship originally called La Coquille and later Astrolabe. The ship wing also traces Russell’s development as a port of call for coastal shipping before adequate roads linked Northland to the rest of New Zealand. The coastal steamer Clansman is represented by an oil painting of it by one of its masters. Kauri gum, coal and manganese were exported from the Port of Russell and even today Russell wharf is an important gateway for visitors to the town.